OXFORD, Miss. – Suman Chandra, senior research scientist in the National Center for Natural Products Research, was honored with an Outstanding Scientist Award at the International Conference on Recent Advances in Agriculture and Horticulture Sciences in New Delhi, India. The Society of Tropical Agriculture gives this annual award to a scientist who has contributed to the study of agriculture and horticulture. Chandra works with NCNPR’s Marijuana Project, housed within the University of Mississippi School of Pharmacy, studying the propagation of cannabis intended for research purposes. 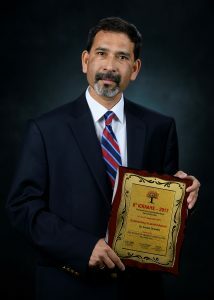 “I was very pleased to receive this award and am grateful to The Society of Tropical Agriculture for recognizing my contributions to the field,” Chandra said. As part of the award, Chandra presented a paper at the conference about propagating cannabis for the purpose of producing cannabinoids. During Chandra’s 18 years working with NCNPR’s marijuana facility, he has screened and selected many cannabis varieties, as well as monitored the cultivation, harvest and processing of standardized cannabis biomass for research. He also participates in developing biotechnological tools and procedures for preserving genetic materials. “Suman is an excellent scientist who has helped us make incredible strides in the study of cannabis propagation and the production of standardized cannabis preparations for research,” said Mahmoud ElSohly, director of the Marijuana Project. Chandra has contributed to more than 50 publications, including a recently published book he wrote with ElSohly titled Cannabis sativa L.: Botany and Biotechnology. “I am grateful to Dr. ElSohly for giving me the opportunity to work under his guidance and for his constant support and encouragement throughout the years,” Chandra said.